We have always struggled with the need for large dominating speakers. We agree that sound quality is most important but if they are going to be so obvious they need to look good. This is why MHM loves these two stylish speaker sets, the first because it is made from glass and the other for its clean retro design. 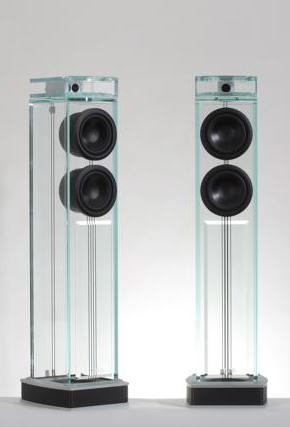 Waterfall, France’s leading specialist HI FI speaker manufacturer has been developing innovative audio equipment designs and patented components encased in glass for over ten years. Their latest design is the new and stunning Niagara speakers. According to the French company “The Niagara speaker provides formidable performance with unequalled elegance and discretion. “ Most reviews we read seem to agree with them. But please do your own research. These loudspeakers can also be teamed with their satellites and subwoofers to create state-of-the-art home cinema packages. 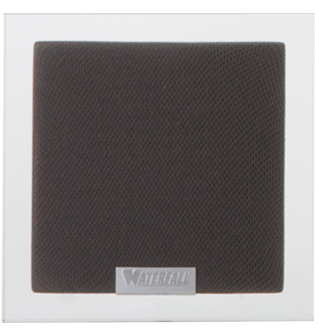 Also take a look at the company’s on wall glass speakers that are sculptured with a thick double sheet of glass and solid aluminium body, these can perfectly be associated to flat screen TVs with a mere 8cm thickness once installed on the wall. Click here to go through to Waterfall Audio Sound Designers website or contact National Audio Group who is listed as their Australian distributor. 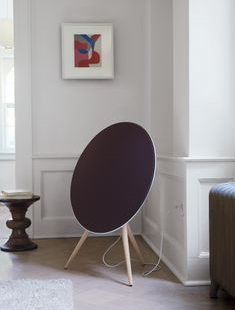 We also love the minimalist design of the Bang and Olufsen A9 speaker system that will stream audio from an iPhone, iPad or Android device over Wi-Fi, DLNA and Apple AirPlay. The speaker features a thin aluminium lining which helps to stabilize the bassy performance while the stretchable speaker grill can be removed and similarly to the ones featured on the B&O V1 TV, can be replaced with a variety of coloured covers which include red, green and silver. All connections and controls are around the back with Line In, USB and Ethernet connections hidden at the rear whilst at the top you’ll find the touch sensitive controls to pause, play and mute with a trail of dimple-like buttons that can be swiped to control volume. Two small lights indicate whether the device is switched on and if AirPlay is in use with a handle grip to help cart the speaker around the house. The speaker can be mountged on the wall with a bracket, or alternatively prop it up from the floor with a set of screw in wooden legs which are available in oak, beech or teak finish. Its stands alone as a beautiful piece of furniture! Click here to learn more about these beautiful pieces from the Bang and Olufsen website.